Are you starting to feel it? The crisp air, the pickup in the wind, and the heat lamps glowing at the “L” stops? Winter is coming to Chicago and it’s a force of nature on par with our victorious Cubbies and our legendary deep dish pizza. However, instead of wreaking havoc on the Indians or your cholesterol, winter may cause damage to your house, if you don’t prepare properly. As a lending hand to all you new homeowners, we thought we’d present your holiday gift early, by sharing with you some easy tips to implement to best prepare your house for winter in Chicago. Clean Your Gutters: This is one that tends to fall by the wayside because it’s so easy. Scooping out handfuls of leaves is one of the most important things you can do to prevent backups, leaks, and flooding. The safest way to dispose of debris is to throw leaves to the ground, then rake them up later. Once the gutters have been cleaned, use a hose to check for leaks. For better drainage, you can add an extension to your downspout as well. Above all else, make sure to climb up and down the ladder slowly and carefully. If you’re afraid of heights, hire the services of a professional. There’s no harm in asking for help! Protect Your Windows: The only thing better than watching the first, picturesque snowfall of the season is doing it draft-free (and we’re not talking about adult beverages). In Chicago, we know how drafty windows can get! Replacing window screens with storm windows is a great start to a draft-free winter. Sealing up air leaks is also key and can be done by weather stripping and caulking operable windows. If you’re looking for a stylish and green way of keeping the cold air out, heavier curtains will eliminate drafts while creating a warm and luxurious decor. Maintain Your Roof: According to the National Oceanic and Atmospheric Administration, Chicago receives an average snowfall of 37 inches of snow per year. That’s three feet of ice and snow piled on your roof that can cause structural damage as it starts to melt. Yikes! Insulating your attic keeps warm air from leaking out and melting snow that later refreezes and creates ice dams. When troubleshooting your roof for wear and tear, keep an eye out for pre-existing damage like curling shingles, rust, or cracks. You may need to hire a professional to replace shingles, install zinc control strips, prime any metal, or seal up the cracks. But it’s better to be safe than sorry! 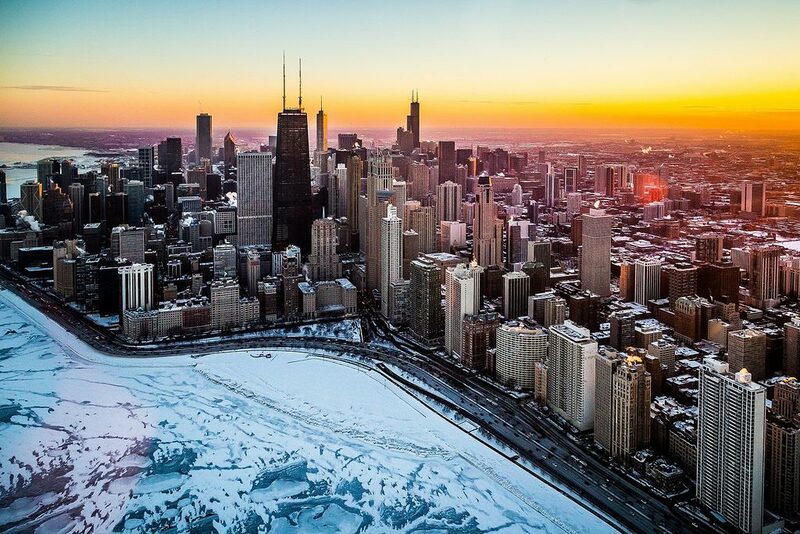 Prevent Frozen Pipes: As intimately familiar as Chicagoans are with the cold, the pipes in our homes are even more so. Even metal can burst under the pressure of expanding water. The easiest thing you can do to keep your pipes from freezing is to not let them sit dormant, which means running water through them from time to time. One simple way of detecting a frozen pipe is if a mere trickle of water comes out when you turn on the faucet. The American Red Cross recommends checking unheated areas where water supply lines are more susceptible to the cold. Installing “pipe sleeves” or “heat tape” will help keep exposed pipes from freezing. Keeping your heat no lower than 55 degrees is also an excellent preventative measure for water piping inside the walls. Keep things cozy! Service Your Heating System: Last but not least, make sure to have your furnace or boiler serviced at least once every year. This is a job for a licensed contractor and worth every penny since it ultimately extends the life of your heating system, reduces fuel bills, and will save it from potentially breaking down during the middle of winter or during your New Year’s Party. But it sure is a fast way to clear out unwanted guests! It is one of New City Moving’s greatest honors to help families all year round move into their new homes and we are especially proud to make the process smooth and pleasant in the face of fierce weather. No matter what the icy winds from Lake Michigan may bring, these tips should help your prepare your house for winter in Chicago and keep your home safe from the inside out!